Mallard's been booted out. 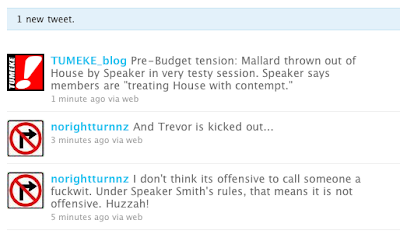 Great - I love Trevor's angry blogs, we'll probably get a few of those shortly now he's just been kicked out of the House. The Speaker was having a hard time of it with the kids in Question Time - they were unusually unruly. As for the Crown's budget tomorrow some of the comments from Ministers today suggest the Landlords are in for a tune up, but the two kids with professional parents combo - National's target swing voters - will be getting hefty income tax reductions when the rates are moved down and this will compensate them for the LAQC clamp-down (at least that's what I take from what they are saying, we'll find out tomorrow). Simon Power was announcing a Financial Markets Authority during Question Time too - that will be seen to be doing something. As for the GST rise - it doesn't need to go up at all and nor should it. A rise to 15% is not supposedly "neutral" - only to the aggregate tax revenue is it neutral in terms of National's income tax cuts, which is heavily qualified stretch of "neutral." It is very un-neutral as to who it affects - it is essentially a type of transaction tax that only effects the end-point consuming individual person and is therefore the least avoidable by the lowest incomes. It amazes me that Act MPs, like Sir Roger Douglas of all people, want to increase a sales tax by 20%. [see UPDATE below] We were told back in the old days when Sir Roger used to be in charge of the Treasury (and the economy) that the higher the sales taxes and the transaction taxes the less volume, the less transactions and the more avoidance it would cause. 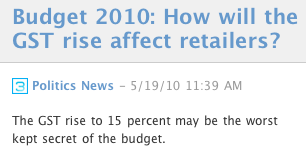 This increases inefficiency, it's a bad incentive etc. etc. - we thought all this was orthodox economic understanding. 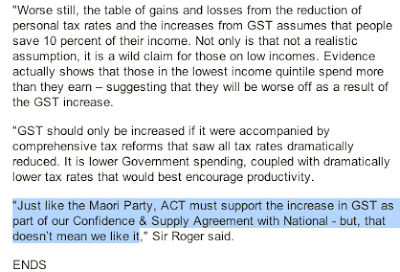 Now he and his Act colleagues are trying to tell us that National are right in increasing a sales tax. And that they are right to keep charging it on top of the local taxes - and on top of everything, including water. Both the Act and the Maori Parties have their own legislation already before the House that can work in a water exemption and a rates exemption into the GST Act so that, basically, your local authority rates bill will have no GST. The United Future MP who is Revenue Minister had a party policy and a bill to do exactly that. This is the time to do it. alledgedly, some higher income earners are avoiding the top tax rate by setting up (legitimate) trusts. glad to see the budget will aid this avoidance without the need for said trusts. Rod Donald is turning in his grave and unsettled. I can feel him but there is nothing I can do. GST was a huge evolution in tax, introduced by Douglas, after the VAT model. We get taxed by Central Government, and we get taxed by local Government. and we get taxed for buying food and necessary life. This Nat government is everything we thought we wouldn't get.